Mr. Pac-Man, also known as Sr. Pac-Man or Puckman, is the protagonist of the Pac-Man series. He is husband of Ms. Pac-Man, and the father of Baby Pac-Man and Jr. Pac-Man. 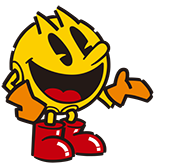 Pac-Man is Namco's famed mascot and was created by Toru Iwatani. Since his first appearance in 1980, Pac-Man has become a legendary video game icon and is one of the most recognizable fictional characters in the world. Pac-Man's first adventure chronologically took place in Pac-Man, wherein he had to fight off a group of Ghosts consisting of Blinky, Pinky, Inky and Clyde, while eating all of the Pellets scattered around a Maze. 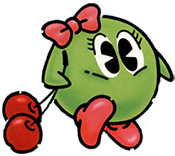 Ms. Pac-Man, also known as Pepper, is Pac-Man's beautiful wife and the mother of Jr. Pac-Man and Baby Pac-Man. She could be considered the deuteragonist of the Pac-Man series. Ms. Pac-Man's first appearance was in Ms. Pac-Man, where she had to navigate a Maze to collect Pac-Dots, while avoiding Blinky, Pinky, Inky, and Sue. During her adventure, she met Pac-Man, who became her husband. Ms. Pac-Man also gave birth to her first son, Jr. Pac-Man, in this game. Ms. Pac-Man looks similar to Pac-Man, but has a large hairbow and eyelashes. Her nose and eyebrows are also smaller than Pac-Man's. Her appearance was frequently altered between games. Originally she wore makeup and had a beauty mark, but some later incarnations of her do not. Sometimes she is wearing boots, while other games have her wearing heels. The colors of her bow, lipstick, gloves, and shoes are often different as well. Jr. Pac-Man, also known as Pac Jr., is the first-born son of Pac-Man and Ms. Pac-Man. He is also the older brother to Baby Pac-Man. 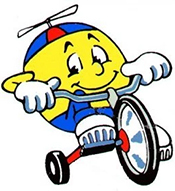 Jr. Pac-Man looks nearly identical to Pac-Man, but has a propeller cap and sneakers on. Sometimes he also wears jeans, making him the only Pac-Person to actually wear clothes. His hat has undergone several design changes in between games. Baby Pac-Man, also known as Pac-Baby, is the second-born, infant child of Pac-Man and Ms. Pac-Man. He is also the younger brother to Jr. Pac-Man. Baby Pac-Man, as one would expect, looks like an infant Pac-Man. He has a mixture of his mother and father's traits, and is often seen wearing a bonnet or a hairbow. He always has a pacifier in his mouth. In most of its appearances, Baby Pac-Man is referred to as a boy. However, in Pac-Man 2: The New Adventures, Baby Pac-Man is stated to be a girl in the opening intro. This was likely an error by the English localization team, possibly getting confused by Baby's hairbow. The general consensus overall is that the character is male. Looks exactly like Pac-man, except he flies, and has special powers enabling him to eat fruit and doors located several miles below him. Sometimes he even wears an incredibly gay cape and mask. A lot of people beleive he and Pac-man are one in the same. A character named Super Pac-Man appears in the TV series - for unknown reasons, he is shown a separate character from Pac-Man rather than as an alter-ego like he is in the game(s). Professor Pac-Man is a character in the Pac-Man series. With the other characters their relations are rather obvious, but Professor's origins are somewhat of a mystery. He is an elderly professor of great knowledge. 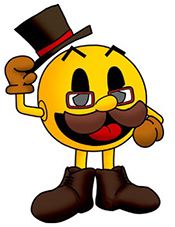 Professor Pac-Man appears as an older gentleman with a white mustache. He wears glasses, and is always seen wearing a professor hat. He is often carrying a book around as well. Originally he did not have the mustache; it was added in Pac-Man World. 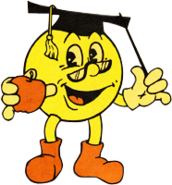 In his first appearance, Professor Pac-Man runs a schoolhouse, quizzing his student (the player) on puzzling questions. Years later in Ms. Pac-Man Maze Madness, A holographic Professor Pac-Man appears as a tutorial guide for Ms. Pac-Man on how to solve certain puzzles. He is also in the opening cinematic, in which he gives Ms. Pac the Pactrometer. A weiner who was introduced later on in the Pac family, long after Baby Pac was introduced, even though he's a bit older. In fact he apparently got a bit older in his second appearence, while Baby Pac was still a baby. Strange things are going on in Pac Land. Currently at age 35, Jr. Pac has no girlfriend and still lives with his parents. Chomp-Chomp (also known as Musha-Musha) is Pac-Man's pet dog. He has a round, Pac-Man-like body, with blue fur and a brown snout. Some later games change his fur color to white or yellow, and sometimes add an orange spot over his right eye. In Pac-Man World, he is proportioned more like a real-world dog; this is reverted back to the original, rounded look in Pac-Man World 2.He first appeared in the Pac-Man animated series. 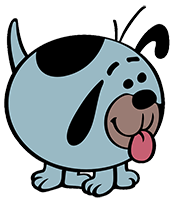 In the Hanna-Barbera cartoon, Chomp-Chomp was an adorable housepet. Another Pac-Family pet, Sour Puss, often tried to attack him, but all of his plans backfired, and Chomp-Chomp never noticed that Sour Puss was even after him. In Pac 'n Roll, Chomp-Chomp made an appearance as a puppy. He, with Pac-Master's family, was banished by the evil ghost Golvis. He is later rescued by Pac-Man. 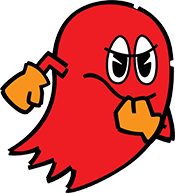 Shadow, better know by his nickname Blinky (also known as Akabei), is the leader of the Ghosts and the arch-enemy of Pac-Man. He chases Pac-Man constantly, and is hard to shake once he starts. Blinky receives a speed boost after a number of pac-pellets have been cleared. He is known to have a short temper, and is good friends with Pinky, Inky, and Clyde. He also has a daughter named Yum-Yum. Character: Bad-tempered, crude, bossy, bully, fast, bratty, grouchy, dangerous, mean, sarcastic, greedy, and the leader of the four. 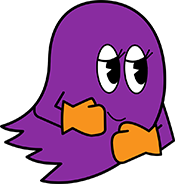 Bashful, or, Inky is a baby blue ghost who, is also known as Aosuke, is one of the four main ghosts in the Pac-Man series. 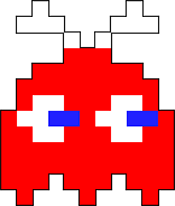 He is often depicted as a goofy and slow-headed ghost, not perusing Pac-Man unless other ghosts are near. Though the smartest, he lacks focus most of the time. In Pac-Man, Inky likes to appear in front of Pac-Man's face. 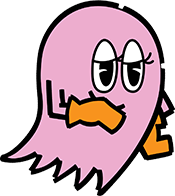 Speedy, known better as Pinky, is a pink ghost, one of the four main ghosts in the Pac-Man series. She attempts to ambush Pac-Man by moving parallel to him. 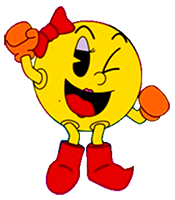 In certain continuities, Pinky has been shown to have a one-sided crush on Pac-Man, which normally goes unreciprocated. Character: Mischievous, persistent, tricky, has a crush on Pac-Man from time to time. 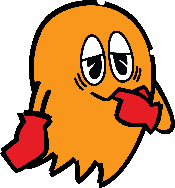 Clyde, whose original name is listed as Pokey (also known as Guzuta), is an orange ghost who, is one of the four main ghosts in the Pac-Man series. While the other three ghosts are off chasing Pac-Man, Clyde will be off doing his own thing. He is typically portrayed as the least intelligent and most submissive ghost. He will chase after Pac-Man in Blinky's manner, but will wander off to his home corner when he gets too close. He lacks the devious natures of his brothers and sister and is considerate towards others. Character: Cowardly and seemingly dumb, but may be smarter than he lets on and doesn't really care about chasing Pac-Man. 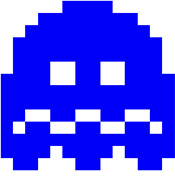 When power pellets are eaten by a Pac-Man character ghosts have a frown, turn deep blue, reverse direction and usually move more slowly. 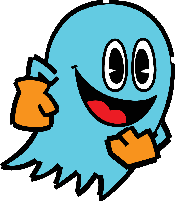 When a blue ghost is eaten, its eyes remain and return to the center box where the ghost is regenerated in its normal color. Blue enemies flash white to signal that they are about to become dangerous again and the length of time for which the enemies remain vulnerable varies from one stage to the next, generally becoming shorter as the game progresses. 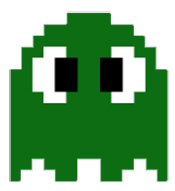 In later stages, the ghosts go straight to flashing, bypassing blue, which means that they can only be eaten for a short amount of time, although they still reverse direction when a power pellet is eaten; starting at stage nineteen, the ghosts do not become edible (i.e., they do not change color and still make Pac-Man lose a life on contact), but they still reverse direction. Character: Cowardly and avoiding Pac-Man. Sue is a purple ghost from the Pac-Man series. 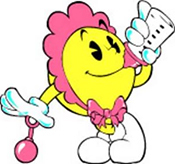 Sue first appeared alongside Blinky, Pinky, and Inky in the game Ms. Pac-Man. She was identical to Clyde from the original Pac-Man, and moved in the same random patterns. The reason for the name change from Clyde to Sue was due to Ms. Pac-Man having her own arch-enemy. This is similar to the orange ghost in Pac-Man Jr., named Tim. 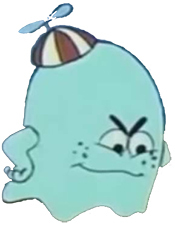 Funky, also known as Common or Camper, is a green ghost from Pac-Mania. He has an interest with Sue due to the constant following. He is noted as the green common. He seems to be Spunky's partner, as they are both commons who appear in the same video game. Funky, like the rest of the ghosts, is an enemy to Pac-Man. Dinky is Clyde, Sue, Pinky, Inky and Blinky's 5 year old nephew who appeared in the TV Series. He loves to annoy his cousins, particularly Clyde, who can't help but show his hatred. He is also friends with Baby Pac-Man (who in the show also appears as a male). Sue is the only one who seems to be calm with Dinky while Clyde, Inky, Pinky, and Blinky are easily angered by him. He only appears in Chomp Out Of the OK Corral and The Greatest Show In Pac-Land, and he is one of the backup Pac-Man ghosts. Yum-Yum is the daughter of Blinky. She is also the girlfriend of Jr. Pac-Man. Yum-Yum looks like a smaller version of Blinky, but with what appears to be either a bow or rabbit ears on her head. In some console versions, it appears to be another propeller beanie like Junior's. Yum-Yum appears in the cutscenes of Jr. Pac-Man. Her and Junior fell in love with each other, but Blinky does not allow them to be together. After catching Jr. Pac-Man giving Yum-Yum a balloon, Blinky chased him down, trying to kill him; luckily the two escaped together, surrounded by hearts. Miru is a friend of Pac-Man. She is a Ghost, but means no harm against others. Miru is a green, blob-like character, similar in appearance to Kirby. She has no mouth, but has very large, cute eyes. She wears a pink bow and shoes. Sour Puss is Ms. Pac-Man's pet kitten. He first appeared in the Pac-Man animated series. 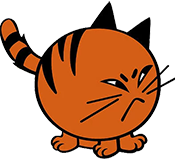 Sour Puss is an orange cat with a round body. He has black strokes of fur on his back and tail. His eyes are slanted, and he has rather angry-looking eyebrows. In Pac-Man World, he is proportioned more like a real-world kitten, and had wide-open eyes; he was also a more yellow-ish color. Pac-Devil is a devil Pac-Man. He only appears in Pac-Man World Rally. 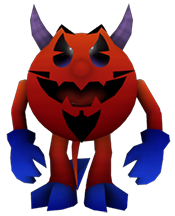 Pac-Devil looks similar to Pac-Man, but has devil horns, crooked teeth, and a beard. His skin is red instead of yellow, and he wears blue gloves and shoes. 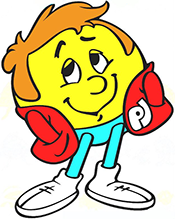 Pac-Master is Ms. Pac-Man's father. He was the former hero of Pac-Land before he passed on his mantle to his pupil, Pac-Man. He also has a wife. Pac-Master is a Pac-Person with a brown mustache. He has a brown top hat and red glasses. 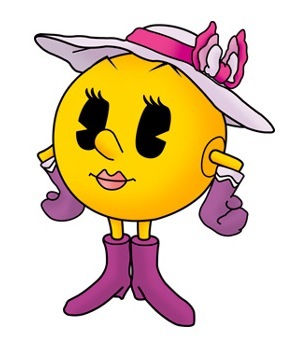 This female Pac-Person is the mother of Ms. Pac-Man and the wife of Pac-Master. She is a female Pac-Man wearing a pink hat and lipstick. Her gloves and shoes are purple. Her true name is never mentioned. 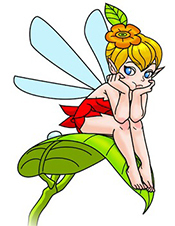 Krystal is the guardian fairy of Pac-Land who acted as Pac-Man's guide and ally in Pac 'n Roll. After Golvis was resurrected by the Ghost Gang and kidnapped several inhabitants from Pac-Land, including the Pac-Master and his family, Krystal appeared to stop him. Recognizing Golvis from the past, Krystal immediately attacked the ancient Ghost. He used his guitar, Jack against her, but she dodged his attack, forcing him to get sucked into his own trap. She then found Pac-Man, the only Pac-Person not captured by Golvis, and told him that he must defeat Golvis. She traveled with Pac-Man through the Gyro-Jungle, where they found Golvis preparing to set up for his show. Krystal advised Pac-Man on how to defeat Golvis, which he succeeded in doing. She followed Pac-Man through until Golvis escaped in his UFO. She then told Pac-Man he must use a cannon to shoot himself up to the UFO. He reluctantly complied, allowing the two heroes to battle Golvis one final time. With Golvis defeated, his UFO was about to crash. Krystal and Pac-Man quickly escaped, though it is unknown what became of Krystal after Pac-Man became a celebrity.